Previously, on MinerBumping... In the epic battle between Vrix Nation and the AFK autopiloting pods of highsec, Vrix was winning overwhelmingly. But could our heroes win the peace? The New Order's activities dominate the thoughts of the people of highsec today. But just in case they do forget, they get killed as a reminder. The Code is about fairness and justice. Even the bot-aspirants tend to realize this on some level, which is why they lie about their crimes. If the carebears are to be believed, our Agents are really, really good at killing insta-warping pods in bubble-free highsec. In truth, killing a pod with a Thrasher almost always requires the pod's pilot to be idle or on autopilot. You'd be amazed how often our Agents get EVEmails from people claiming they weren't on autopilot. It is technically possible for a pod to warp at "zero" but fall just short of the stargate. This would leave a very narrow window during which a Thrasher might be able to lock the pod and kill it before the pod slow-boats within jump range. Even then, the odds of a successful gank aren't good. (1) All the more reason not to fly a naked pod through highsec. It's bot-aspirancy to assume safety in a pod. (2) To kill a pod that's being manually warped through highsec, our Agents must be extraordinarily elite PvP'ers. Are we to believe it's a coincidence that all of these innocent non-autopiloters just happen to hold heretical, Code-violating beliefs? Doubtful. If you violate the Code, be honest about it. Sylvarius Shifter was guilty of going AFK and autopiloting his pod, but at least he wasn't guilty of lying. Of course, candor in a carebear is no virtue when it comes at the expense of politeness and respect for the Code. We saw Demi Moor earlier. From time to time, carebears will send a tearmail and follow it up with an additional tearmail--unbidden! Randar Austrene was disgusted by our Agents' practice of putting down pods. More hypocrisy: Randar thought killing pods was too easy. As if it's some impressive feat to go on autopilot and whine when you get ganked? Perhaps anticipating the counterargument, Randar preempted it with a follow-up. Several hours later, he amended his remarks to include a warning about EVE losing subscribers if too many autopiloters get ganked. I'm sure our Agent took this point into consideration. Vrix Nation's investment in highsec paid off when Karl Beck offered a full confession. Despite Karl's excuses, the admission of autopiloting encouraged our heroes. It was a sign: Keep killing pods, and good things will happen! "...custome to lying to people as are word is all we have to judge each outher by"
If he places so much importance on words - as he should - then the least he could do is to run a spellcheck, prior to messaging an Agent of the New Order, no less. Autopiloting is definitely becoming rarer, but I've noticed a strange new phenomenon. The rebels only switch on autopilot when they know we're about! How's that for logic? Ganking is an excuse to bully. Gankers can make excuses like "helping the market" or "killing bots" but all ganking is just internet touhguys trying to make themselves feel important. My citadel in Hageken is still open and offering a safe place for everyone except gankers. Gankers knowledge of pvp is to basic to be a problem in Hageken. Our rebel group will take down any gankers that trys to kill in those systems. I am not scared of gankers acting like scared children lol! You all need to try harder! :D Mostly Karma Balancer and his TNT alts lol. Your all too basic of players to compete with me. I can play 3 games at the same time and still crush you in Eve. CODE/TNT alts fail posting to my Evewho. What's the matter? Give up already Karma? Maybe you can help Lady have a baby if you dont give up to soon! Still mining in highsec never worried about highsec wars, gankers cant fight wars with bad security anyway. BV mining is a safe haven for all normal high security players, no fail aloud! This is a highsec miner trying to get CODE to go to his enemies system to hurt them because he can't do it himself, we see this a lot! ... he's got a point about the internet tough guys / bullying thing though. We are definitely that. I admit it, I like bullying.There I said it! I love how he keeps blaming things on TnT. My guys gank on our alts yes but we haven't lowered ourselves to making real like threats or comments about people over an Internet video gsme. 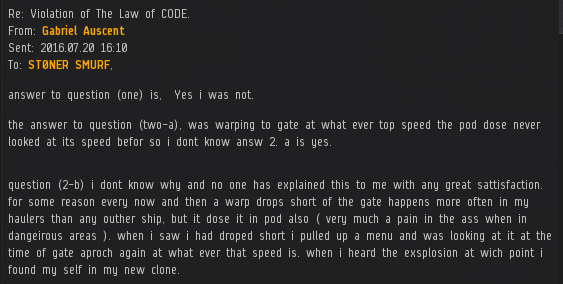 Codex once again CCP did a plover presentation at fanfest about suiside ganking and it's effect on eve. I suggest you watch it. Hi there, I hear you recruit retards like loyalanon. No thanks, I'll join another corp. You don't just give away ISK to people and then get banned over and over. That's just failing incredibly hard, day in and day out. Oh no! What will we ever do? An anonymous crybear on the comments section of our blog doesn't want to join the New Order! James help us! Maybe you can join the hisec militia? You could be their blog's first reader! Oh yeah I member. Member his online radio show. He'd double your isk. Then once he had you on teamspeak he'd make you recite the code... like a pirate! I member to double your isk back you'd have to contract everything over to him. If you had a mining barge and not a permit you'd loose the game. I member one time a guy made it to the BONUS ROOM! Oh yeah that was great. They made him pod himself 100 times in Jita. He had to do it to win! Member when they got the 'contestant' to undress in front of his webcam and rub mayonnaise on his crotch. Yeah that was sick! I member those Code agents recorded the whole thing and posted it. Member the size of that banhammer that came crashing down? You're 'membering' it wrong. Yeah we did those things but it was all for fun. No one made them try to double their isk. Member when your alliance killed over 1 trillion ISK in a month? Having trouble membering? That's ok. I member last year when CODE. killed over 1 trillion isk in all but one month. And that was just the members of the New Order within CODE. alliance.